Home affordability slipped slightly last quarter, dragged down by rising mortgage rates and recovering home prices in Tennessee and nationwide. 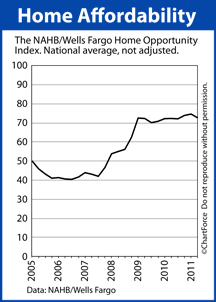 The National Association of Home Builders reports a Q2 2011 Home Opportunity Index reading of 72.6. This means that nearly 3 of 4 homes sold last quarter were affordable to households earning the national median income of $64,200. Q2 2011 marks the 10th straight quarter — dating back to 2009 — in which the index surpassed 70. Prior to 2009, the index had never crossed 70 even one time. However, we must remember that the Home Affordability Index is a national survey. From region-to-region, and town-to-town, home affordability varied. In the Midwest, for example, affordability was highest. 14 of the 15 most affordable markets nationwide were spread throughout Ohio, Michigan, Illinois and Indiana. Only Syracuse (#9) cracked the list from other regions. By contrast, the Northeast Region and Southern California ranked as the least affordable markets. Led by the New York-White Plains, NY-Wayne, NJ area, 7 of the 10 least affordable areas were in New York, New Jersey, and California. For the 13th consecutive quarter the New York metro area was ranked “Least Affordable”. Just 25.2 percent of homes were affordable to households earning the area median income there.